Good Afternoon Everyone! I hope the sun is out where you are in the world. Today Creative Card Crew is having another challenge. This weeks challenge is Cute and Girly. Please go over to their blog and check it out here. This challenge is sponsored by Whimsie Doodles. I used the adorable Science girl image on my card! You can find this digital image here. So cute! I love it! Always like Whimsie Doodles designs. Darling! I love the colors and the paper. 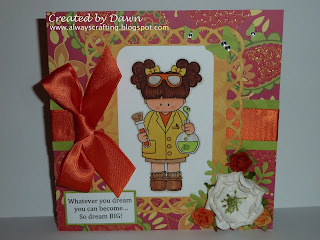 What a darling card - great colors, cute image! Thank you for participating in the Craft Us Crazy Something New and/or All Our Favorites Challenge! So adorable! Love that frame die! Thanks so much for joining us over at "Fairy Fun Fridays" and good luck! 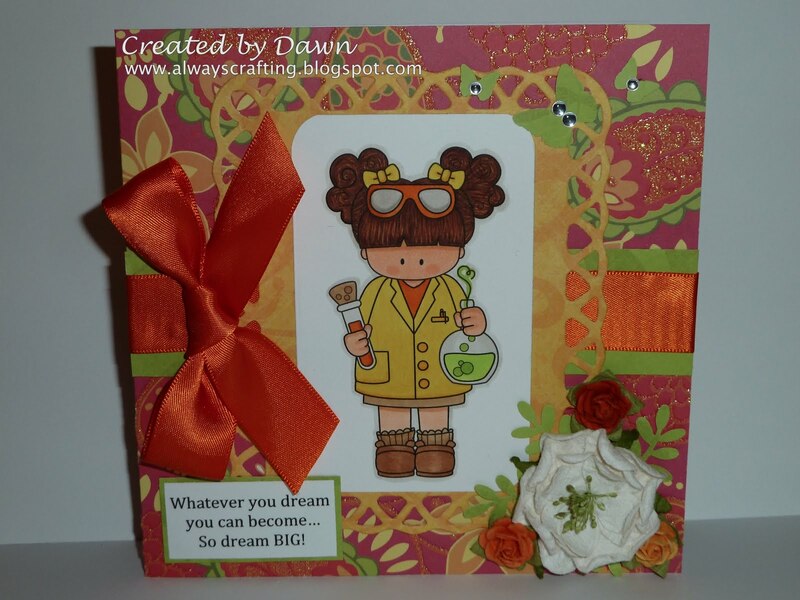 Love this card, gorgeous image and fantastic bow.Thanks for playing along at LCI this week. What a lovely image... Thanks for joining the orange challenge at LCI this week! This is a very lovely card, Dawn. I love your fab colours and little image. Thans for playing along this week with Papertake Weekly Challenge. This is so cute. Love that image and your papers are so pretty. Thanks for playing along in the orange challenge over at LCI. Hello! What a lovely card. I really like the vibrant colors that you have used!